Before I start, and as an advisory note to my blog's drive-by haters, let me define "quitting" - it happened 2.5 days into my 3 day detox, in my defense. And, as you'll read below, it's not because I'm a wuss. 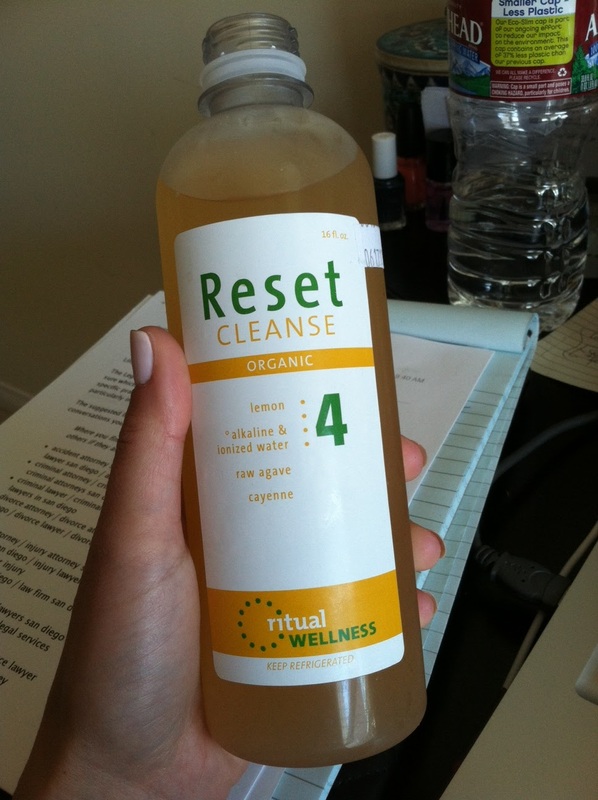 Last year, a friend of mine highly recommended the Ritual Reset cleanse by Ritual Wellness in Orange County. I filed it in the back of my mind. Juice cleanse? That was some heavy stuff, not my style. Give up food? I think not. Fast forward a few months, and my bff asked me if I'd do a juice cleanse with her. Given that we run races together every month and have done numerous insane physical endeavors together, I figured if I was ever going to take it on, the time was here. So we signed up for Ritual's Seasonal Cleanse and got ready for - well, we didn't know what. Ritual offers to have your juices couriered to you between 12-6am the morning of your cleanse. In my idiotic decaffeinated stupor, I had messed up the address (uh oh, it was already happening...), but Byron called J and made the delivery. When J & I returned from spin class that morning (oh yeah, we were ambitious that first day) our cooler bags of juices were there. All 18 of them plus 2 juices in case we decided to work out during the cleanse (we wouldn't). 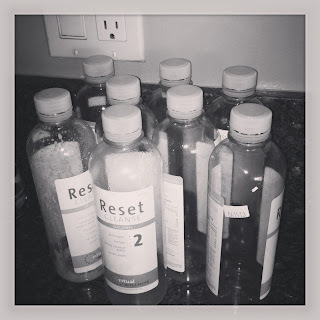 We broke open juice 1 of the Reset Cleanse, an organic mix of kale and other green loveliness. And I went off to work! I was feeling good and clean and knew I was doing something great for my body. Ready to do it! Lunch with the guys. Guess which one's me. business colleagues. Two men whom I had warned ahead of time I wouldn't be joining in eating. A photo of our lunch table. Not photographed: Mikel making fun of me all through lunch and offering me bites of his veggie burger. A frequent faster, he assured me it's par for the course. I went back home and kept back at work. I was feeling slow and the headaches were setting in, but I kept reminding myself that that's how detox works. The worst part about day 1 was the headaches and fogginess. I just felt like a space cadet, and probably would have felt crazy if I didn't have a friend to compare symptoms to. By 7pm I was completely exhausted and started feeling rough. I figured sleeping early (yes, 9pm) was the way to go. I was ready to break into the last juice of the day, #6, which is a nut milk and rather filling. I sipped it in bed while my eyes drifted to sleep. Day one, done! After a nap and some Advil, I felt MUCH better. In fact, I started to feel splashes of that euphoria people always say they have on a cleanse. I hadn't felt it once, but I started to feel very clear. I took advantage of it and sat at the computer, cranking out my first really good work in 2 days. I even started to admit to some other friends what I was doing. I had this in the bag. If this is what detoxing is, sign me up! I can get behind this! I woke up with a raging headache and realized I'd had one most of the night. Had I even really slept? I moved myself to the couch with juice #1. I was almost done! I could do this. Bad toxins, begone! I tried to drink some water. And next thing I knew, I was... throwing up. Violently. I had heard different things about detoxes - that you'd spend quality time in the bathroom (maybe with some cleanses, but this one is based in food, so no), that you pee a lot (obviously), and that you'd have headaches. But nowhere had I read that you'd throw up so violently that you'd consider going to urgent care. I probably wouldn't have been surprised if I'd experienced it early on, but I'd felt pretty ok, so I got worried. But I wanted to be a trooper, so I went back to the fridge for Juice 2, a tasty pineapple juice, and next thing I knew, I was vomiting again. I scared the HELL out of the housekeeper, that's for sure. I moved myself to the couch (my place of refuge) and slept. After a few hours, the headache was only getting worse. I knew that my body needed electrolytes and something it could keep down. Me: "Lilly, why are you pushing yourself to continue this?" Me: "I want to do this! I want to be healthy and learn better eating habits, and rid my body of toxins!" Me: "Do you feel healthy right now?" Me: "Did you learn what you wanted to learn?" Me: "Do you want to land in the urgent care explaining to a doctor that you overdid it on a juice cleanse? Do you want to be THAT girl?" Me: (hangs head in shame) "No"
It was time to break up with my cleanse. I knew my electrolytes were suffering, so I ate a few saltines and drank Pedialyte, and I passed out. I felt better, but not great. I had more saltines, so I could down a much-needed Advil. When I awoke, I was 90% old me. I could think straight, I felt optimistic about life! Now, I'll admit, I'm drinking #4, a cayenne lemon water, as I type this. I learned a LOT in 2.5 days of doing detox, but it wasn't worth pushing myself through another 8 hours just to say I did. I regret that my first "real" food had to be saltines, but I wasn't about to add the price of a doctor's visit to the price of my fancypants juice. I emailed with Ritual this evening and they responded very quickly-and compassionately. Because I felt better after having saltines, we were pretty sure it was a severe detox symptom and not anything to do with their juices. I've already recommended this particular juice fast to other friends. If you're going to do it, you should do a quality pressed juice like Ritual's. They send encouraging emails throughout the days of your cleanse plus their customer service is excellent. And, like I mentioned before, I was miraculously NEVER hungry throughout the time I did their detox. Now that I'm feeling a bit better, I may even drink the nut juice before bed. Done and done! *How much junk we pass as "food". Compared to many people I'm a pretty darn healthy eater. But yesterday (day 2) I walked by a burger place, a place I would have normally loved, on the way to my car-and got nauseous. I was floored that it's one of my favorite foods. 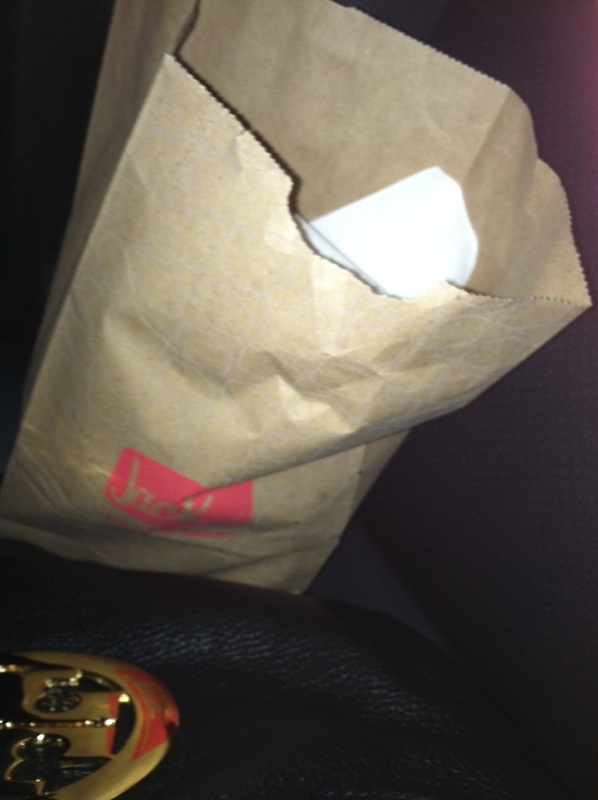 Remember, I was the person at Jack in the Box just two days before. I'm sure I'll eat one again, I mean I'm a realist, but it made me realize how desensitized we get to what we eat and how food like that definitely doesn't need to be part of a regular weekly rotation. *How sweet natural foods taste. By Day 2, J & I were talking about how sweet the pineapple juice tasted- too sweet! The amount of sugar in our daily meals (many times snuck into your food by restaurants, making it tasty) had desensitized us to real sweetness. *How much I eat when I probably don't need to. Of all the symptoms I felt during the cleanse, surprisingly hunger wasn't one of them. It kills me to admit that every women's magazine ever is right, but I guess I eat when I'm thirsty... or pissed. Trust me, people annoyed me while I was on my cleanse (probably heightened by my decaf-ing), but I couldn't reach into the pantry and hush them with a snack. It made me realize how often I do that, and how easy it is to let things slide off your shoulders when you are so foggy that you couldn't give them attention even if you wanted to. *Take on your crazy health endeavors with a buddy. Having someone else texting you back that they really DO understand your misery makes a difference. *Try everything once. I never thought I'd pull something like this off, definitely not for 2.5 days, and while I probably wouldn't do it again, I'm glad I did it once. As with detoxing on crappy food, same with taking caffeine out of the rotation. It just gives you a glimpse of the other side and what is/not working for you. As a parting gift, enjoy this hilarious clip about juicing. This is nice that you are prefer juice, Juice is very good for health. I like noni juice. It is very tasty and healthy. I wanted to thank you for this great read. Your blog is one of the finest blog . Thanks for posting this informative article.